Chicago Teachers Union President Karen Lewis speaks outside Mahalia Jackson Elementary School in Chicago about the planned closing of 54 public schools. Opponents say the plan will disproportionately affect minority students in the nation's third-largest school district. 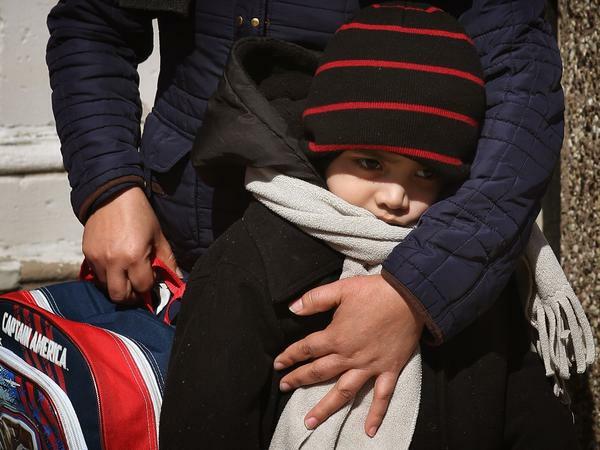 Juan Carlos Ordonez, 5, gets a hug from his mother at Chicago's Jean De Lafayette Elementary School, one of 54 schools slated for closure. Ordonez attends a special education program for students with autism or severe and profound disabilities. About 170 of Lafayette's 480 students are in the program. There were protests all day Thursday against the proposed school closings, including one outside the home of the Chicago school board president. At another later in the day, Tekeeva Thompson, a lunchroom attendant at a school on the list, implored the district not to close any schools. "These children look at these schools as safe havens. They come from broken homes, some of them, and violence is a big issue. Closing these schools will separate them. They depend on each other as well as we depend on them," Thompson said. The district says it's closing 54 schools and programs in all; the actual buildings proposed for closure total about 60. They are overwhelmingly in black neighborhoods where there's been a big population decline in recent years. Schools spokeswoman Becky Carroll says they are also communities that have historically been underserved. She says the school closings will allow the district to combine resources by consolidating schools, and that students will get better educational opportunities. "Whether it's libraries, computer science labs, even things like fresh coats of paint help to provide the kind of learning environment and support that kids need to be successful," Carroll says. Timothy Knowles, the head of the University of Chicago's Urban Education Institute, says he understands the rationale behind Chicago's move. "There's no question about the economics here. Maintaining half-empty, century-old buildings doesn't make sense for cash-strapped cities and states," Knowles says. The school district says it will save $560 million over the next decade. But Knowles says no city in the country has made changes of this magnitude in one year. He says one of the biggest challenges for Chicago will be whether the children will go to better schools. Another is whether school closures will put children's safety at risk. Many of the schools are in high-crime areas where gang violence is common. While the school district plans to have community patrols to help students get to their new locations, the Rev. Paul Jakes says it will be dangerous for plenty of kids traveling through competing gang turf. "We're coming to say that if any child's life is lost, that the blood of that child is on the hands of Mayor Rahm Emanuel," he says. Chicago's massive school closing announcement comes just weeks after Philadelphia voted to shut down more than 20 schools. Chicago Teachers Union President Karen Lewis, who led a strike early in the school year, says Emanuel should be ashamed. "Closing 50 schools is an abomination," Lewis says. "But for him Wall Street will be cheering, 'cause that's what they did about Philadelphia. This is not a game between mayors to see how many schools they can close. These are real children's lives." The union will rally against the proposed closures next week, and school board members will vote on them in May. Several big cities have closed schools to reduce costs and offset declining enrollment. Chicago is the latest. School officials have released a list of more than 50 schools to close. The district faces a $1 billion shortfall, and the mayor, Rahm Emanuel, says many of the city's school buildings are half empty. As NPR's Cheryl Corley reports, some parents and teachers say they will fight to keep the schools open. UNIDENTIFIED MAN: When our schools are under attack, what do we do? UNIDENTIFIED GROUP: Stand up, fight back. CHERYL CORLEY, BYLINE: There were protests all day against the proposed school closings, this one outside the home of the Chicago school board president. At another later in the day, Tekeeva Thompson, a lunchroom attendant at a school on the list, implored the district not to close any schools. TEKEEVA THOMPSON: These children look at these schools as safe havens. They come from broken homes, some of them, and violence is a big issue. Closing these schools will separate them. They depend on each other, as well as we depend on them. CORLEY: During a conference call, the school's planning officer, Adam Anderson, read the roll call of schools the district considers under-utilized. ADAM ANDERSON: Yale Elementary: This is another school with fewer than 200 students. CORLEY: The school district says it's closing 54 schools and programs in all. The actual buildings proposed for closure total about 60. They are overwhelmingly in black neighborhoods, where there's been a big population decline in recent years. Chicago school spokeswoman Becky Carroll says they are also communities which have historically been underserved. She says the school closings will allow the district to combine resources by consolidating schools, and students will get better educational opportunities. BECKY CARROLL: Whether it's libraries, computer science labs, even things like fresh coats of paint help to provide the kind of learning environment and support that kids need to be successful. CORLEY: Timothy Knowles, the head of the Urban Education Institute at the University of Chicago, says he understands the rationale behind Chicago's move. TIMOTHY KNOWLES: There's no question about the economics, here. Maintaining half-empty, hundred-year-old buildings doesn't make sense for cash-strapped cities and states. CORLEY: The school district says it will save $560 million over the next decade. But Knowles says no city in the country has made changes of this magnitude in one year. He says one of the biggest challenges for Chicago will be whether the children will go to better schools. Another is whether school closures will put children's safety at risk. Many of the schools are in high-crime areas, where gang violence is common. While the school district plans to have community patrols to help students get to their new locations, Reverend Paul Jakes says it will be dangerous for plenty of kids traveling through competing gang turf. REVEREND PAUL JAKES: We're coming to say that if any child's life is lost, that the blood of that child is on the hands of Mayor Rahm Emanuel. CORLEY: Chicago's massive school closing announcement comes just weeks after Philadelphia voted to shut down more than 20 schools. Chicago Teachers Union President Karen Lewis, who led a strike early in the school year, says Chicago Mayor Rahm Emanuel should be ashamed. 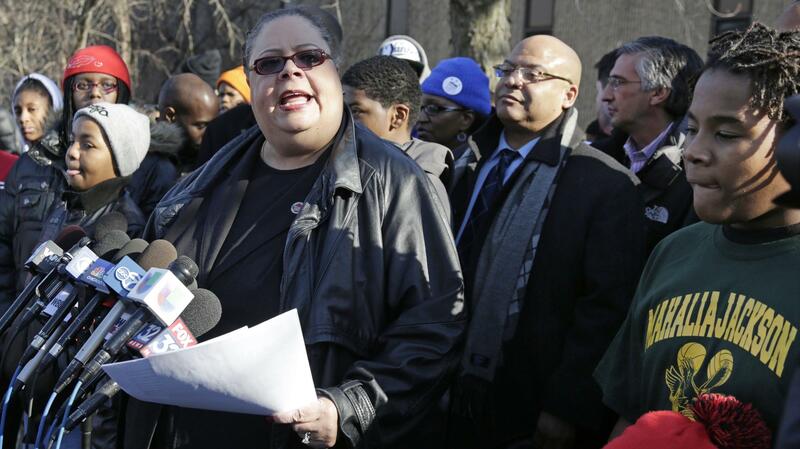 KAREN LEWIS: Closing 50 schools is an abomination. But for him, Wall Street will be cheering, because that's what they did about Philadelphia. This is not a game between mayors to see how many schools they can close. These are real children's lives. CORLEY: The union will rally against the proposed closures next week, and the Chicago school board will vote on them in May. Cheryl Corley, NPR News, Chicago. Transcript provided by NPR, Copyright NPR.